Three new items that evoke thoughts especially appropriate to the Easter season are reviewed in this week’s column: the Tabernacle Choir’s beautiful new recording, He is Risen; the third in Elder David A. Bednar’s trilogy, Power to Become; and a lovely illustrated children’s book, The Sacrament. All three come through Deseret Book but may be ordered in various formats. He is Risen features only six selections and runs barely 26 minutes — surely one of the shortest in the Tabernacle Choir’s history. Yet it’s also perhaps their most affordable album, at $8.99. Well-written liner notes give insights into the history of each selection. The pieces are all familiar and memory-filled for me. 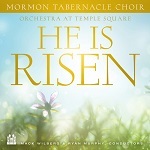 “Christ the Lord is Risen Today,” one I’ve sung every Easter since childhood, has different chords and harmonies in this arrangement by Tabernacle Choir conductor Mack Wilberg. “In the Garden,” a century-old piece evoking the experience of Mary Magdalene as she first saw the resurrected Christ, was sung at the funerals of my grandmother and mother. Gilbert Martin’s powerful setting of the 1707 Christian hymn “When I Survey the Wondrous Cross,” which our kids all sang in their high school choir, still brings a tear when I hear it. Associate Conductor Ryan Murphy’s light, airy arrangement of an old Primary song, “Jesus Has Risen,” by Thelma Johnson Ryser, features additional new lyrics emphasizing the Savior’s love for all. I was looking out over the old city of Jerusalem one Easter morning in sacrament meeting with our family when the organist seated behind and above us in the large auditorium of the Jerusalem Center began his booming intro of “He is Risen.” Unforgettable! The choir and Orchestra at Temple Square do it full justice here, opening with a trumpet fanfare and adding handbells. They are equally powerful in the album’s final, full-on “Worthy is the Lamb,” which brings back stirring memories of singing those thrilling “amens” in Handel’s Messiah over the 28 years I sang with the Oratorio Society of Utah. Elder David A. Bednar takes the title Power to Become from D&C :28-30. 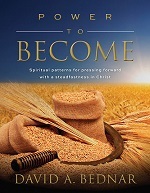 The third book in the trilogy, after Increase in Learning and Act in Doctrine, “builds upon and extends the spiritual patterns” described in the first two. “How can we really know how we are doing, and if our course is in accordance with God’s will?” he asks. The book discusses gospel principles and patterns that will help readers find the answers for themselves as they read, make notes in the wide margins, and ponder on thought-provoking questions at the end of each of the five chapters. The first chapter on the Atonement and character of Christ sets the tone for what follows, and each chapter closes with references related readings. In addition, QR codes and printed URLs provide links to short videos of personal discussions Elder Bednar has conducted with various groups on the topics (194 pages, including a good index, $23.99 in hard cover). 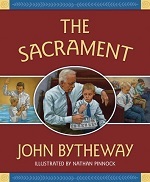 Popular youth speaker John Bytheway turns his attention to an even younger audience in The Sacrament, a children’s book appealingly illustrated by Nathan Pinnock (32 pages in hard cover, $18.99). The rhyming story of a boy and his grandpa, inspired by a poem by Walter M. Horne, teaches what to think about — and what not to — as a boy finds himself distracted during the sacrament. (“There were hundreds in the chapel but the worshippers were few.”) With some encouragement from Grandpa, the boy thinks back on his baptism day and turns his thoughts to Jesus. It’s a simple but memorable book. The author’s additional explanation of the symbols of the sacrament, along with scriptural references, will enlighten adults as well as children.